Comprehensive Vein Care for Chronic Venous Insufficiency. You don’t have to live with leg pain or be afraid to show your legs. Spartz Vein Clinic, located in Roseville near the Twin Cities of Minneapolis and St Paul, specializes in venous disease in all stages of progression — From spider veins to chronic venous insufficiency. 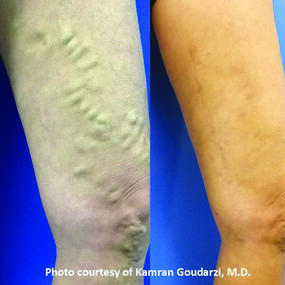 Varicose Veins are larger veins that are often visible as “ropes” or collections of bumpy veins on the leg. Larger than reticular veins, they are often associated with aching, heaviness, itching, burning, cramping at night, or the sensation of swelling in the leg. Reticular Veins are very close to the surface of the skin and often bluish in appearance. They usually do not protrude or bulge out and they are slightly larger than spider veins, usually about 1-3 mm in diameter. Leg swelling may be caused by venous disease. Most of the time venous swelling worsens throughout the day and is worse after periods of prolonged standing. DVT is where a clot forms in one of the deep veins of the venous system. The symptoms may include swelling, color change and pain in one leg. These clots not only damage the vein, but they can also be life-threatening. Spider Veins (telangiectasia) are the smallest veins nearest to the surface of the skin. These veins can sometimes have pain or itching associated with them, but for the most part, they are treated because they are cosmetically undesirable. In more advanced venous disease the skin can undergo changes such as discoloration or thickening. These changes are thought to be a result of the pooling of blood and added pressure in the leg as the vein valves fail to bring blood out of the foot and leg adequately. Venous ulcers occur when the skin breaks down completely as a result of untreated venous disease. This type of ulcer is often tough to heal and even if it does heal, if the venous disease is not treated the ulcer will often recur. SVT is a relatively common inflammatory process affecting the superficial veins. This is an acute process where a clot forms in a superficial vein resulting in a red, hot, tender area around the affected vein.